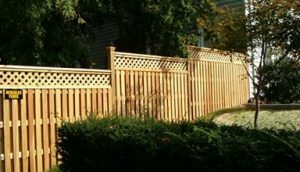 Increasing the height of your fence is a great way to obtain privacy in your backyard. If you are looking to increase the amount of privacy you have in your backyard, you are in luck. There is quite a few way to make your fence taller. While you can add to your landscape with strategic plants and vines, there are faster options for when you don’t have the time to wait for a plant to grow. However, it is important to do your research before you start building. Look not only into materials and costs but check out your local bylaws and ordinances. See what is allowed and obtain any necessary permits before you start building. If you don’t you may be forced to remove all of your hard work and have wasted your money and time. If there are regulations about fence height where you live which prevent you from having privacy, this is an excellent option. Install a privacy screen within your own property line with supports that lean on the fence behind it. This is actually an excellent way to block other taller buildings from seeing into your property. This can actually do a lot more for blocking the view than simply elongating your fence, as these screens are set within the property line. You can extend the supports of your fence and add homemade lattice, which will provide partial privacy until vines fill it in. An overall square lattice grid can provide a privacy without sacrificing air circulation. Post extensions are often installed with metal hardware called tie plates. Lattice can be suspended from chains and framed to create a unique pattern that offers a strong aesthetic effect as well as privacy. Large scale open lattice makes excellent dividers while more high-intensity lattice can be used for privacy fence and to conceal parts of your lawn. This entry was posted on Friday, August 25th, 2017 at 4:22 pm. Both comments and pings are currently closed.